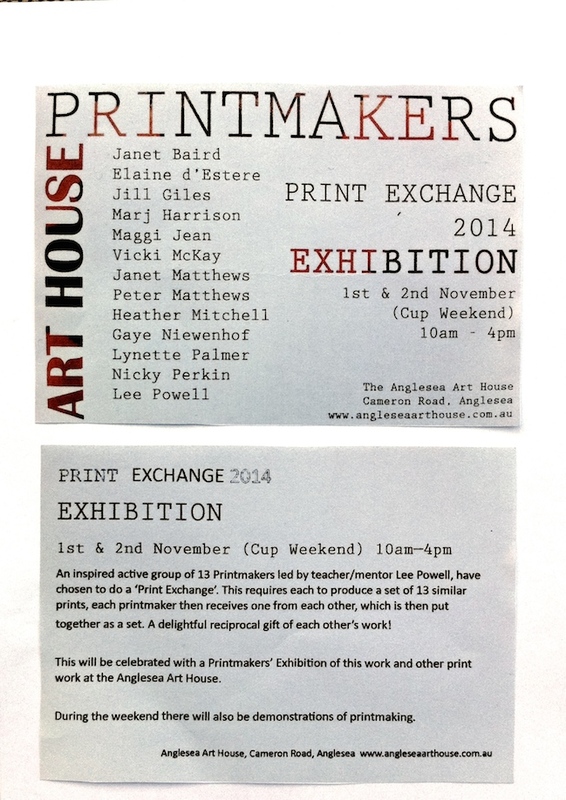 The Anglesea Art House Printmakers have produced diverse body of artwork that consists of collographs, etchings and linocuts. We come from different backgrounds and experiences but share a fascination with printers’ inks, handmade and print papers, colour, tone, texture, shape and line and the many different materials from which our plates are made. The most popular is the collograph plate process made from straw board sealed with shellac (or otherwise ply or masonite) perhaps allowing for more freedom of expression compared to the more constricting processes of etching in particular and linocut. Etching plates are usually metallic (copper, zinc or aluminium) or perspex or acetate. However the collograph can produce a more painterly look compared to the often more graphic appearance of linocut and etching. The compositions/images depicted by our group vary from abstraction through to figurative imagery. The artists make visual commentary about their investigation, interpretation and response to different aspects of nature/culture and pre-Colombian myth. A thank you to Nicky Perkin who designed the envelope, invitation and poster and to Lee Powell who organised this show. Categories: Prints | Tags: Anglesea, art house, culture, environment, exhibition, nature | Permalink. Occasionally I post photographic images of my immediate environment on the Surf Coast at Anglesea, Victoria, Australia. Behind the town lies a coal mine (brown, wet, thermal coal) and power plant polluting the air with particulates and the highest sulphur dioxide emissions in Australia. Just from the many artists’ views that I have canvassed around this locality, apart from all the other issues including climate change and health issues, visually we always face an eyesore, one that hints at the bigger one which threatens the National Estate Listed Anglesea Heath and potentially the Otway Ranges National Park. I hope the day comes when I walk at sunrise and the plume of toxic emissions is no longer a blight on the horizon. Categories: Preliminary photographs | Tags: Anglesea, coal mine, pollution, Shut it Down | Permalink. The first layer was a washy pink over which I printed red, black or grey and also a rolled grey area in 2 versions of the image. While I have not altered the original image etched on to the plate I have altered the colour placement by way of masking and roll up. I enjoy making different versions of the one image which results in a variable edition. 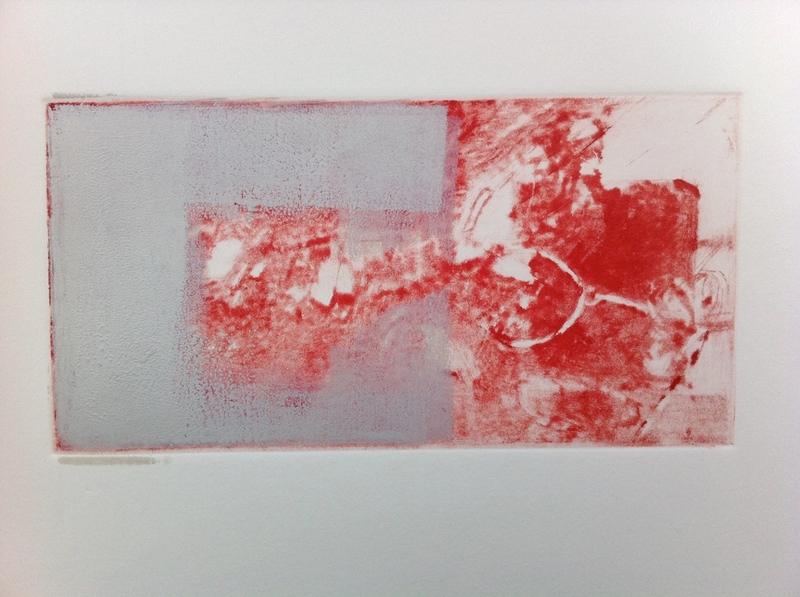 Categories: Prints | Tags: contemporary etching | Permalink.